Our 30mm Snap Frames clip open for easy poster changing. Our Round Cornered 30mm Snap Frames are available in black and white, in a range of sizes. Our snap frames feature a 1.5mm rigid plastic back panel and a UV grade PVC anti glare cover to protect your graphics. They are supplied with fixings and our stock snap frames are individually boxed. Our Poster Snap Frames are the ideal solution for business locations that require regular, easy poster replacement. Spring hinges in the profile ensure a tight grip on the poster and an easy opening process. 20"x30" Silver Round Corner Snap Frame, 30mm. For posters 508mm x 762mm. 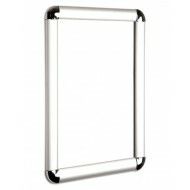 Our 20" x 30" Silver Ro..
30"x40" Silver Rounded Corner Snap frame, 30mm. For posters of 30"x40" (762mm x 1016mm). Our ..
40"x 60" Round Corner Silver Snap Frame, 30mm. For a poster that is 40 x 60 inches (1,016mm x 1,5..
A0 Silver Round Corner Snap Frame, 30mm. For posters of 841mm x 1189mm. Our A0 Silver Round Corn..
A1 Black Snap Frame, 30mm with Round Corners. To display posters of 594mm x 841mm. Our A1 Black ..
A1 Silver Snap Frame 30mm with Round Corners. For posters of 594mm x 841mm. Our A1 Silver Round ..
A2 Round Corner Black Snap Frame, 30mm. For displaying a poster of 420mm x 594mm. Our A2 Roun..
A2 Round Corner Silver Snap Frame, 30mm. For a poster that is 420mm x 594mm. Our A2 Round Cor..
A3 Round Corner Black Snap Frame, 30mm, for a poster of 420mm x 297mm. Our A3 Round Corner Bl..
A3 Round Corner Silver Snap Frame, 30mm. For a poster that is 420mm x 297mm. Our A3 Round Cor..
A4 Round Corner Black Snap Frame, 30mm, for a poster of 210mm x 297mm. Our A4 Round Corner Bl..
A4 Round Corner Silver Snap Frame, 30mm. For a poster that is 210mm x 297mm. Our A4 Round Cor..